VANCOUVER, April 26, 2017 /CNW/ - Canadians expect to retire at 62 and live to the ripe old age of 85 on average, resulting in one of the longest retirement windows amongst their global peers (global averages: 61 and 81 years, respectively). However despite expectations of a long retirement, Canadians are amongst the least likely to say they actively seek information to guide their financial decisions (42% vs. global average of 56%). 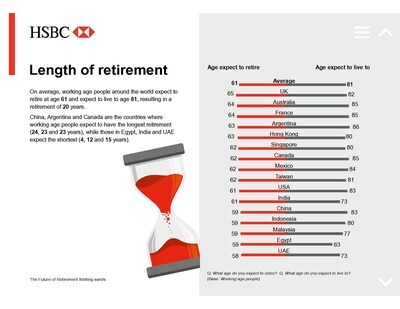 This, according to HSBC's the Future of Retirement: Shifting Sands, a new global retirement report capturing the views of 18,414 people across 16 countries and territories worldwide – including 1,003 in Canada. The complete Canada report is available at www.hsbc.ca/retirement. "Our latest research suggests that the good news is that Canadians are anticipating to enjoy a longer retirement and lifespan than many of their global peers – the less than great news is that they're not actually planning for it," said Larry Tomei, Executive Vice President and Head of Retail Banking and Wealth Management, HSBC Bank Canada. "Interestingly, technology is really changing the way people plan and save for retirement; and while about one-third of working age people in Canada expect new technology will help make it easier to save for retirement – such as doing research online, using an online retirement calculator or trying out a robotic financial advisor – the data makes clear that many western nations are falling behind in terms of taking full advantage." Siri: can you help me plan for a better retirement? I'd be happy to. Technology is changing the way people save for retirement. 31% of working-age people in Canada agree that new technology makes it easier to save for their retirement. This is well below the global average (47%), with a much higher proportion of working age respondents in China (77%) and India (69%) than in France (17%) Argentina (28%) and the UK (30%) agreeing that technology is helping them save for retirement. East vs. West retirement trends? Namaste. Only 29% of working age people in Canada think think they will be financially comfortable when retired (global average: 34%), with those in India (69%) and Indonesia (61%) the most likely to think this, and those in France (10%) and Australia (21%) the least likely. Money under the floorboards? Hand me a shovel! Property is still viewed as a good way of saving for retirement, with 38% of working age people in Canada saying they think it delivers the best returns – albeit well below the global average of 47%. This is not yet fully reflected in retirement plans, with only 16% of working age people in Canada expecting property to help fund their retirement. Let it ride? No thank you. 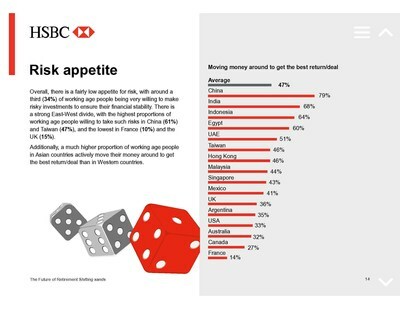 Canadians have a comparatively low risk appetite, with just over one in five (21%) saying they would be very willing to make risky investments to ensure their financial stability, and 22% saying they'd risk financial losses (global averages: 34% and 28%, respectively). In comparison, the highest proportions of working age people willing to take such risks are in China (61%) and Taiwan (47%), and the lowest are in France (10%) and the UK (15%). What's your dream retirement job? Just over one half (55%) of working age Canadians say they will continue working to some extent in retirement; 66% would be willing to defer their retirement for two years or more to have a better retirement income; and 44% would work for longer or get a second job to sustain their saving for retirement. Within Canada, there is little variation between generations' expectations of when they will retire and how long they will live. Millennials expect to retire at age 61, Generation X at 63 and Baby Boomers at 64 (global averages: 59, 61 and 64 years, respectively). Millennials in Canada expect to live to age 86, while Generation X expect to live to 83 and Baby Boomers to 85 (global averages: 79, 81, and 84 years respectively). 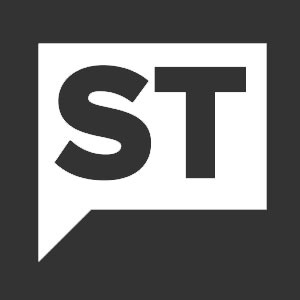 About half (52%) of people surveyed in Canada believe that Millennials have experienced weaker economic growth than previous generations, while 54% agree that Millennials are paying for the economic consequences of older generations, such as the global financial crisis and rising national debt (global average: 52% and 58% respectively). And while 46% of people in Canada say that Millennials don't know how good they have it, enjoying a better quality of life than any generation before them, this is below the global average of 54%.